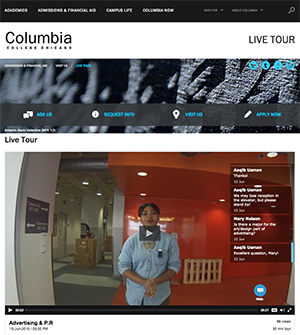 Prospective students at Columbia College Chicago can now view live-streamed, interactive virtual tours in HD. The institution has partnered with vicarious travel platform Georama to broadcast tours for students who cannot make a physical trip for an on-site visit. Typical viewers include out-of-state students who can't afford to make a trip to all the universities they are considering, international students who don't have a visa to make a trip prior to college admission, or students who simply wish to experience the campus virtually before making the investment to visit in-person. Tours can be viewed live or on demand. The college has already completed dozens of tours with the new technology and has more scheduled throughout the summer. Tour guides are equipped with a GoPro camera and technology from Georama that combines multiple cellular and WiFi networks for a stable HD stream. Viewers can interact with the guides in real time to ask questions and make suggestions. Guides showcase the different parts of campus, including departments, classrooms, facilities, dorms and more, to give viewers an authentic perspective of what campus life is like. "With the use of Georama's platform, we've made it feasible for anyone to take a tour of our campus from anywhere in the world, at any time," said Ania Greiner, director of admissions events and services at Columbia College, in a press release. "From the comfort of their homes, students and parents can participate in a campus visit and learn first-hand what our college offers."